Interests - Max is a typical boy, loves boys toys, cars, buses, lorries, trains etc, but his favourite at the moment is Fireman Sam!! Max was born with chronic renal failure, which meant that both of his kidneys were not working and he has only ever had about 5% kidney function. Max was 8lb 6oz at birth but had a lot of fluid around his body and within 24 hours he weighed 7lb 4oz. Max has undergone several operations in the past 2 years, the first one at 3 days old to create an artificial opening through his tummy wall into his bladder so urine could drain constantly, and to insert a dialysis catheter, which was never needed so was removed when Max was 10 weeks old. More operations followed and Max has spent lots of time in hospital, or at home attached to one machine or another, but he has always been so brave and resilient. Max has had dialysis previously but had constant infections in his catheter line so was taken off dialysis in September 09, and by nothing short of a miracle, Max has not needed dialysis since. All Max’s doctors are baffled as to how Max’s little body is coping, and how he remains so well, as he really should be critically ill, but Max is a fighter and doesn’t let anything get him down or stop him. Max is waiting for a kidney transplant and is about to go on call for a donor, whilst his mom and dad are both being assessed as potential donors. Max has regular blood tests to monitor his condition and he has an injection once a week, and is fed via a gastrostomy. Max has a huge food phobia but with the help of several therapists is slowly learning about food and can now touch certain foods, although he doesn’t eat anything at all. Although Max is 2 and a half, he is very small, in only 6-9, or 9-12 month size clothes!! Max is due to start pre-school in September, so we are currently trying to order uniform for him, in his tiny size!! After a very difficult 8 months we are very pleased to say that Max is doing really, really well! Max’s transplanted kidney is working well and he’s now able to eat and drink and has even managed to go back to school! With this in mind we feel it is time to move on and let other children who need the smiles more receive the post and lovely gifts you guys send! We are extremely grateful for all the post Max and his siblings have received over the past few years, and for all the love and support shown to us during some difficult times! I’m very happy to say Max is now home after 5 months in hospital following his kidney transplant… and so far so good!! 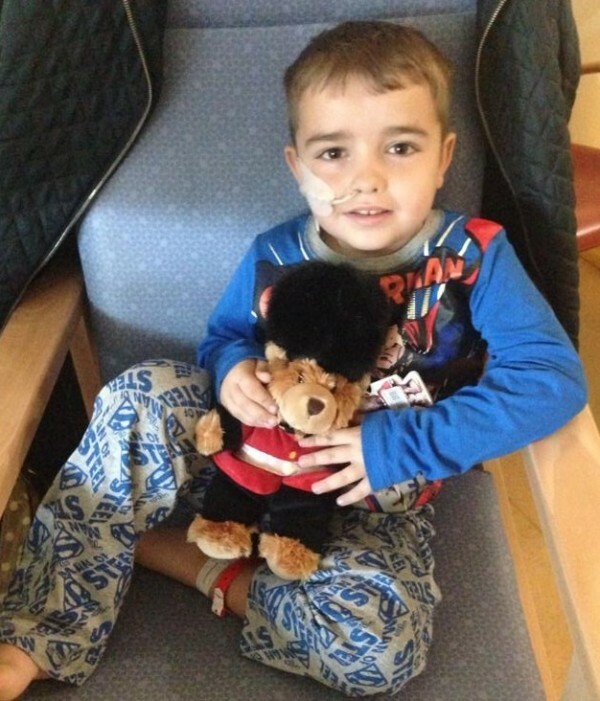 Max has been in Southampton General since 28th November and still no sign of coming home. Jack has decided he’d like to give up his post for poorly children as he’s older now, but thank you to those who sent to him. Kacey and Max still both love receiving post, so a massive thank you to anyone who sends things. Thank you so much for all the love and support you have all shown towards Max and our whole family during Max’s kidney transplant. Max is doing really well and the new kidney seems to be working well. We’ve all had a sick bug recently which meant Max needed to spend a couple of days in Southampton hospital, but hopefully we’re over the worst now. Three weeks ago today my baby had his kidney transplant! What a long 3 weeks it has been, with lots of ups and downs! But… (all being well!) we’re transferring back to Southampton for a couple of days then hopefully HOME!! We all cannot wait to have Max home and have some family fun time! Thank you for your support along the way! Day 5… Max is doing well, he’s able to move himself in the bed using his hands and feet, and he’s sat out in the chair twice! His bloods are still coming down but very slowly, and his urine output is good. Ultrasound shows good blood flow to the kidney. Max has a small amount of internal bleeding in his bowel, which is being very closely monitored, so he’s only allowed sips of squash at the moment. Max is very vocal, and is saying the funniest things, making us all laugh so much… he’s one amazing little lamb. Max is doing ok, he’s been in a lot of pain but pain relief has been increased, so he’s now sleeping a lot. SAM (the kidney) is still sleeping but is doing well and we are hopeful it will kick in soon, meanwhile Max’s kidneys are holding their own. The surgeons and nephrology team are happy with the situation and its just a waiting game now. Max is having lots of IV fluid so is very puffy. Thank you for all your good wishes and for keeping us all in your thoughts. Max had his kidney transplant yesterday. He had a restless night in ICU but is battling on as always. Max’s dad, who donated his kidney, is up and out of bed and hoping to be able to visit Max soon. Max is currently in hospital and is going to receive his dads kidney. Max continues to have haemo-dialysis 3 times a week in Southampton Hospital, which is very time consuming and poses many restrictions, both socially and physically due to his perma-cath lines. Max is always positive and such a happy cheeky little chap though, you can’t help but love him!!! We are all very grateful to everyone who stops to think about, and send a little card, note or gift to brighten his day. The colouring and sticker packs are brilliant, we create many pieces of art, which hang with pride! Kacey and Jack also love receiving their post, and it is so lovely to see the smile on their faces, so THANK YOU so VERY VERY much. Max is doing well, though still dependent on haemo dialysis 3 times a week at hospital, whilst waiting for a second kidney transplant, either from a live, or deceased donor. Max has many restrictions and has a lot to cope with but remains happy with a positive outlook, which keeps the whole family going. So sorry for not getting in touch for ages, Max has kept us all on our toes!! He’s had quite a good run of health over the past few weeks, until last week (30th October) when he became quite poorly with high temp etc, so he was admitted to hospital where he stayed for over a week. He has now come home but we have to return to the hospital daily for IV antibiotics, due to the infection that Max had, which we now know is a blood infection!! Max is still on haemo dialysis 3 times a week, but he copes well and now does some school work whilst having dialysis. Firstly can I say a MASSIVE thank you to everyone who has shown us all so much love and support over the past few weeks, we have all been through a really tough time, so THANK YOU!!!! We really appreciate it! Max is doing ok, he’s now on haemo dialysis at Southampton hospital 3 times a week, he copes well with it, and it means he is closely monitored, which he needs right now. He needed a blood transfusion last week, but seems a bit better now. He returned to preschool for the first time today and loved it, after screaming and crying for the first 20 minutes!! We are all hoping to establish more of a routine now, so a little bit of normality can creep back in to everyday life, or is this to much to ask for?! Max continues to be happy and cheerful most of the time, he can be a cheeky monkey, but it is his fantastic personality that carries us all through the ups and downs! Thank you to everyone at Post Pals, you’re all stars! Max is having yet another trip to theatre, this time to remove the new kidney as the transplant has failed and it’s making him very poorly. Well, after a very long and exhausting roller coaster journey, tomorrow is going be d-day! Kidney stays and we struggle on? Or kidney comes out and we get my baby well, recovered, and home with a plan! Personally, after seeing him struggling to breathe today and needing oxygen, I think we should remove it and let him heal. Nobody wants a half hearted transplant that’s causing more problems than previously had! So let’s wait until tomorrow to get a plan and do it. I just want my baby safe and well, we’ve all had enough now! Max was doing really well after his kidney transplant and was hoping be home at the weekend, but he wasn’t transferred as ‘bloods showed early signs of rejection’. It meant he had to go to theatre for biopsies as the scans showed the kidney wasn’t emptying properly and so a catheter was put back in. IV meds were needed, but after 6 needles that day he had no veins left, so they had to wait for a PICU doctor. Max’s bladder wasn’t working properly but the biopsies showed no sign of rejection. He is now in ICU. Surgeons removed a large blood clot from the artery to his kidney. The kidney has been saved but he has had to go back on dialysis to give it a rest. Our thoughts are with Max’s family and also with his donors’ family. Post can be sent to Max in hospital, he would love to receive some smiles! Address: Beach Ward, Evelina Children’s Hospital, St Thomas Hospital, Lambeth Palace road, Westminster, London, SE1 7EH, United Kingdom. Max got his call and had his transplant! He is getting stronger by the day and hoping to transfer to his local hospital soon. Max is doing really well on dialysis at home, but it means we are sometime restricted by the routine. However, we manage and Max’s siblings are amazingly understanding and supportive. No news on transplant yet, but hopefully it wont be to much longer, although sometimes it seems like an impossible dream! Thank you so much for every piece of post, which the kids just love receiving, and really brighten up their day. Jack (Max’s brother) had lots of birthday cards which is just lovely. We’re all very touched by people’s generosity. Thank you so so much for your lovely cards and gifts sent to Max during his long hospital stay whilst his dialysis was established and balanced out. The post really cheered him up and helped pass the time of day. Max is home for now, long may it last! Max now needs dialysis daily (12 hours out of any 24 hour period) and will be going into hospital tomorrow for 3/4 weeks (maybe home for a couple of days in the middle somewhere!). He will be going to theatre on Tuesday afternoon to insert the dialysis catheter, and hopefully starting dialysis after about a week or so. Max continues to do well against all the odds!! We have been told it is only a matter of time before Max requires dialysis again so we enjoy each day as it comes at the moment! Max has recently gone from a cot to a big boy’s bed – a massive step for someone attached to machines over night – and very scary for mummy too!! He has done fantastically though and is such a big boy now!! Thank you to everyone who continues to put smiles on the children’s faces with your lovely cards and gifts. 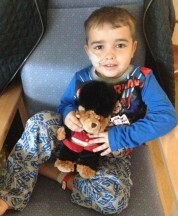 Thank you for Max’s lovely teddy which he now snuggles up with in bed, and thank you for Kacey’s fabulous parcel. The packaging was brilliant, almost too nice to open! 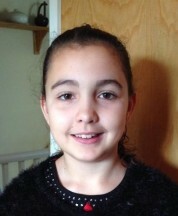 Kacey loved all the items in the parcel and has had great fun. Many thanks. Thank you so so much to everyone involved in the elf scheme. Max and his siblings had some amazing gifts and their little faces light up when receiving such amazing parcels. Just magical, thank you. Thank you to EVERYONE for everything, from cards to gifts, they all mean so much and make Max and his siblings so happy. Max continues to do extremely well with very little medical intervention, which completely baffles all our doctors, who describe Max’s condition as ‘eye wateringly painful to read on paper’. Yet Max is doing well at present as though he has no illness, so he is allowed to plod on for now, although we have been told he could become very very poorly very very quickly as his blood results already show that he should be chronically ill, so we make the most of every day. Max has started Pre School now and he really does enjoy it (once I’ve left him and he has some dutiful tears, for my sake of course!). We are hoping to meet the transplant surgeon as soon as possible to get the ball rolling for Max’s transplant, but it is quite hard to co-ordinate appointments when we live 160 miles away from the hospital!! A massive thank you to Beckie for Kacey’s box of goodies for this month’s theme, she was so excited walking home from school that I thought she might actually burst, she LOVED it! Everyone loves the Dottie project, our litter mate Ellie goes everywhere with us, and we do get some strange looks when we are taking pictures of her! She even has her own facebook page! And THANK YOU to everyone who continues to send post and put a smile on the children’s faces! Max is due to start main stream pre-school on the 8th September after the staff receive some training from the medical team. This is such a marvellous milestone which we didn’t know if would reach, so it is quite an emotional time right now. Max has about 4% kidney function at the moment, but continues to fight and live life to the full with very little medical intervention. This really baffles the doctors and consultants, but in their words, something is working so don’t change it!! We are due (overdue really!) to meet the transplant surgeon and transplant consultants in London soon (hopefully this month) to get Max listed for a deceased donor and to continue the work up for a live donor. We are hoping to get away for a few days towards the end of the month, not too far, just a little break, which will be nice. Thank you to everyone who has sent post to Max and his siblings, they really do enjoy receiving their post. Max and Kacey were really excited to receive a letter from Dotty, and cannot wait to meet their new puppy – they have lots of adventures planned. Max loves sticker books so has had lots of fun playing with them this month, especially as the weather has been rotten!! Thank you so much to Donna & Matt for the gorgeous hand made teddy for Max, he loves it. Max and his siblings really love getting post; it is amazing to see such a huge smile from such a small gift/letter, so thank you so much to every ‘friend’.